Posted on November 6, 2018 by gayle. 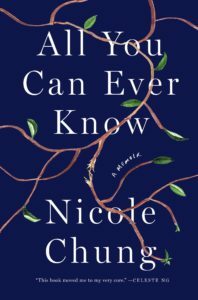 This entry was posted in Memoir, Non-Fiction and tagged adoption, all you can ever know, memoir, nicole chung. Bookmark the permalink. I’ve been hearing all kinds of good things about this one. And I love stories about cultural differences within families living in America (ex: Shelter by Jung Yun). I’m going to add it to my Nonfiction Nov TBR list since (shockingly!) I’m almost done with my original TBR. I have one more book to go, then I’m going to take a little fiction break, then maybe read one or 2 more nonfictions. I’ve been hearing a lot about this book lately! I imagine it must be incredibly frustrating when people treat you as if you have closure and everything is easy just because adoption papers have been signed. I should see if my library has it, so I can add it to my Nonfiction November stack too! It would be a good non-fiction pick.